Extra Large, Foldable, Portable, lightweight and easy care. Product Parameters: Fleece, foam, waterproof backing reinforced polyester. Having fun outdoors doesn't need to be uncomfortable, that's where this outdoors picnic blankets can take the stress out of worrying about what to sit on and make you the hero of any outdoor activity. reinforced polyester backing offers improved water & wind resistance. EASY TO TRANSPORT - Includes carrying buckle & handle for easy roll up for transport. MACHINE WASHABLE - Washing machine safe for quick & easy clean up. 3-layer design. Top of blanket is made with 100% soft polar fleece; back of blanket features reinforced waterproof backing(PEVA) for increased water and wind resistance Which won't irritate your skin. The fleece and the middle layer together give you more comfort. Our Blanket measures 78 X 59" when open but only 12" x 7" when roll up and its large enough to fit 4 to 6 adults. Guaranteed to withstand harsh weather conditions. This Insulated Picnic Blanket is sure to impress your friends and Family for years to come. New stylish design will never go out of Style. Spot clean or hand wash for maintenance: Plastic backing is easy to wipe clean by wet cloth, liquid stain on fleece is easy absorbed by tissue. It's easy to shake off the sand from the beach blanket. Perfect for camping, picnics, days out to the beach or park, summer festivals. It can be used as tent carpet or temporary break bed. What a great gift Idea!! This Gorgeous Blanket makes a great present for any time of the year. Give the ones you love a useful and lovely Tote set they can enjoy with friends and family during park and camping outings. Great CORPORATE Gift idea, Super original Company Event gift item will sure be a wonderful conversation piece. 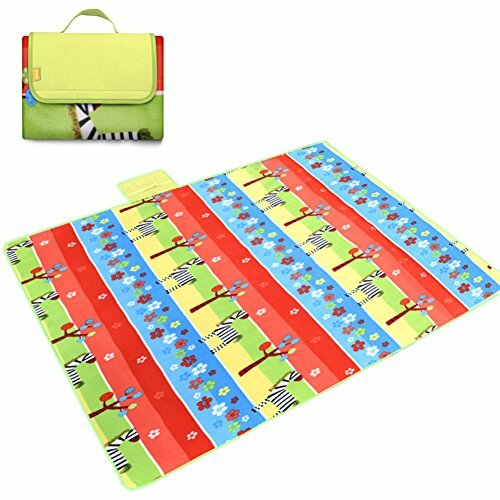 Also Check out our: kid picnic blanket, picnic blanket waterproof, picnic blanket for kids, heavy duty picnic blanket. View More In Picnic Backpack Accessories. If you have any questions about this product by Kedera, contact us by completing and submitting the form below. If you are looking for a specif part number, please include it with your message. Foldable Outdoor Picnic Blanket Tote Cushion Seat 50" X 60"